And when temperatures are sizzling is when MB Crusher units prove how tough and tenacious they are. We are in Al Kharj, a small village in the south of Riyadh, in Saudi Arabia. The Lime & Sandlime Bricks company is working in a very huge quarry and the temperature is more than 50°. All the machines are working to recover inert material to be reused for the construction of in the new subway in Riyadh. Two MB crusher products have been used in this quarry: the BF135.8 crusher bucket (for excavators weighing over 43 Ton) and the MB-S18 screening bucket (suitable excavators between 20 to 35 Ton). In fact the largest models have been manufactured to satisfy the needs of the operators in the quarry sector, where the performance of hourly production yields and of resistance over time are necessary. In fact the MB patented system allows achieving the expected manufacturing targets and a strong reduction in the costs linked to the consumptions, even with particularly sturdy materials. Many are the characteristics that can be immediately appreciated about the MB buckets, among which the versatility of use, the possibility of crushing on site under any condition and the capacity of lowering the costs they offer. 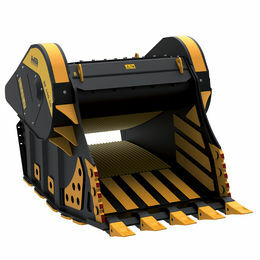 The crusher bucket, in fact, operates in couple with an excavator, normally already available at every worksite. 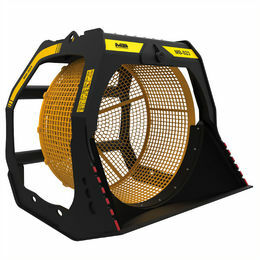 Even large companies, which in their own quarries already own large crushing installations, ever more often decide to equip themselves also with the MB crusher buckets, which allow them to cover many particular situations and processes, such as working in tight spaces and spaces difficult to access.